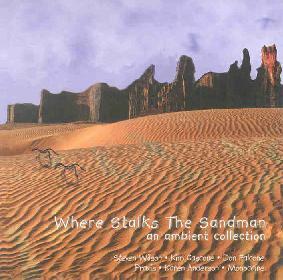 Various Artists - "Where Stalks the Sandman "
This new compilation from Don Falcone's Noh Poetry label focuses mainly on the darker aspects of ambient music. Kim Cascone has been into ambient electronic music for a long time (via the Heavenly Music Corporation, PGR, Thessalonians and Spice Barons) and serves up a good one to begin the album with "Pythagorean Sea II", a journey through a dark Tangerine dream-like nightmare hollow. Heavily layered, wave upon wave of dark drowning synth washes, drones and creaky space echos, slow and agonizing. When convenient, headphones are a must for this album. Monocaine's "Ars Moriendi" offers some intense drones of the quietest, spaciest, freakiest sort. A few minutes in there's an effect as if an electric hell-furnace has just opened upon the already frightening picture. Compositionally obscure, stop-and-start, with lengths of pure silence, but the sounds themselves are intense and bizarre enough to keep you agog in the ether, before you're hit with more electronic blasts and rolls of the darkest wave. Steven Wilson (Porcupine Tree, Bass Communion, etc) lends a break from the nightmare-scapes with his more melodic and rhythmic "A Grapefruit in the World of Park", sampling a pretty Robert Fripp guitar-wail and surrounding it with heavenly, lilting space keyboards. Like a lot of the best ambient music, it's complex and minimal at once, worlds within a world waiting to be discovered by the careful listener. Karen Anderson's "Ouroboros" is much briefer (approx. five minutes) and busier than the other pieces, firing a melange of dark creepy tones and the most percussive sounds heard on the album so far.There are several intense shifts in its brief stay, but time is relative in this aural galaxy anyway. Incredibly quiet and slow-moving is Falcone's own contribution "An Isolated Craft", a staggering 26 minutes in real-time, a challenge to try to describe. This "beep-beep... beep" is the only recurring rhythmic element throughout, but it often changes keys or is mimicked by variations later on. Halfway through it sounds like some sort of woodwind. Deep engine-drones start up, only to fade away. Later on some aggressive electronic shrieks and turbo-space rockets jump out from the low-key ambient pool, emphasizing a theme of drama-extremes which abounds on this album. Eventually the background becomes a more standard wind-buffeted wave and the earlier rythmic bleeping has morphed into a more jangly sound, though amazingly still resembling the original somewhat. A little less dark than some of the others, but every bit as stark. The closing track is another shorter piece, a remix of Praxis's "Fascism (Bush Klan)", which strays far outside the pure ambient realms, a rather energetic six minutes of numerous chirpy keyboards, barking effects and even some tribal percussion, though not as engrossing as the others. All in all, this is a hell of a standout release for the oversaturated genre. For more information you can visit the Noh Poetry Records web site at: http://www.home.earthlink.net/~falcone/. Contact via snail mail c/o Noh Poetry Records; 2248 Fiji Way; San Leandro, CA 94577-5438.